“Life has its moments…make them special.” That’s our motto and fits our story perfectly. Back in 1988, Frank and Claudia Schwarz were young and adventurous, excited about sailing. Their hunt for good wind, and maybe a sailing- based business landed them in Cabarete, Dominican Republic. At the time, Cabarete was blossoming into a vacation hot spot for European and French-Canadian windsurfers due to a burst of magazine coverage touting never-ending, side-shore wind. The Schwarzs seized the opportunity to rent an empty lot in the center of town. They built a Cana-hut to house their inventory of 6 boards. Their wind sports center, Spin Out, lifted off the ground. And that search led them to the “end of Cabarete”. They found a large piece of property with a house, a 12-room hotel, and enough space for a windsurf school. Claudia started renting rooms at Hotel Gigi as part of windsurf tour packages offered by Happy Surf. During this time she became friends with the local doctor who owned the hotel. For several years the doctor tried to convince the couple to buy the hotel. When they started a family and felt the need to settle down, the Schwarzs decided to take him up on the great deal he offered them. 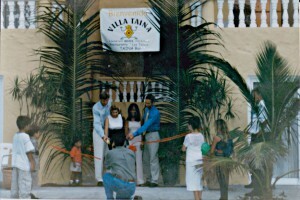 On May 31st, 1996, following some sprucing up, Hotel Villa Taina made its grand debut as a family business with 14 guest rooms and a beach front bar named Happy Bar. The name Hotel Villa Taina was inspired by Claudia’s fascination with the DR native Taino Indians, well known for their friendliness and close connection to nature. Her large collection of Neo-Taino Indian artifacts found a home in the hotel lobby. Some pieces can still be found on display today. Fast forward a few decades: Villa Taina is still owned by the Schwarzs and investors. Claudia is still fascinated with the Taino…and even more driven with providing her guests with an experience they won’t forget. The philosophy underlying the hotel motto, “Life has its moments…make them special”, is the reason some guests have been returning for nearly 20 years. 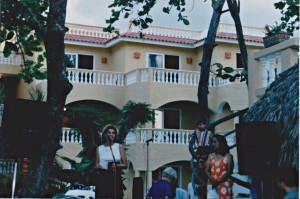 The Hotel is much larger today than it was in 1996, presently offering 61 rooms. More often than not Claudia is still on-site making sure everyone feels at home. And they do.